Looking for Heater Control Panels? Get a quote fast. Heater control panels are used to keep liquids from solidifying. The specifications for each heater control panel will vary depending on the temperature required to sustain the liquids in their state, the specific application requirements, and the devices it needs to control and connect to. Heater control panels control a variety of devices in order to automate, control and protect the process, including pressure sensors, temperature sensors, level sensors. Pressure sensors keep the vessel containing the liquid from dropping in pressure; temperature sensors keep the liquid from overheating or freezing; level sensors ensure that the heaters remain immersed. Common heater control panel uses. Heater control panels allow the operator to meticulously control the temperature of the heater (or heaters) in a given system, while also controlling and monitoring the process throughout. Heater control panels are able to control either a single or multiple heaters, depending on what the application calls for. 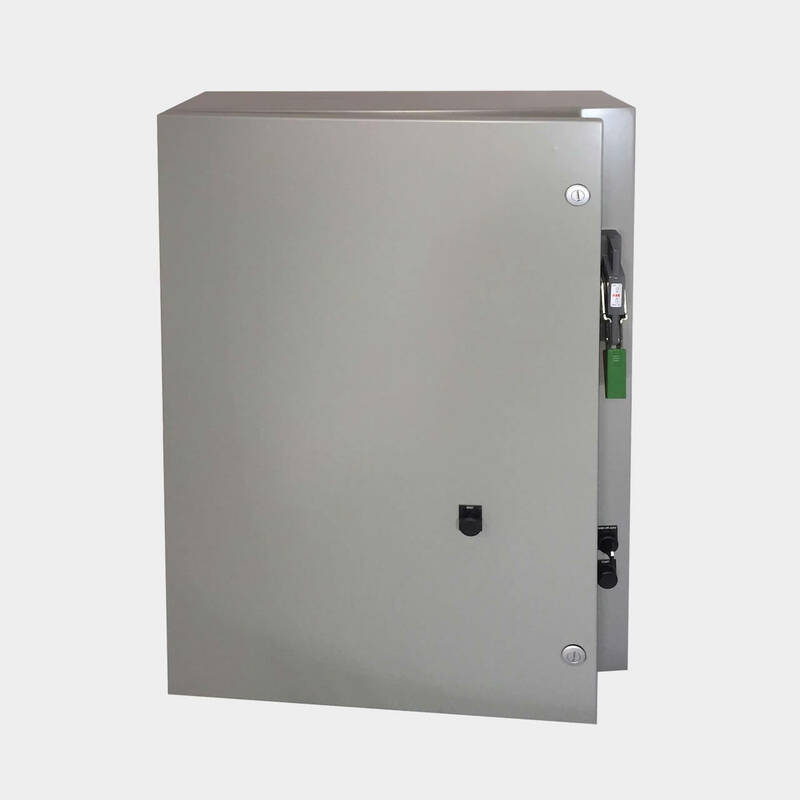 These panels can operate with a fixed or variable output, are generally wall-mounted, and most commonly call for a NEMA-1 or NEMA-4/4X control panel enclosure, depending on whether it is installed indoors or outdoors. Of course, other types of enclosures may be used. Don't know which type of NEMA-rated enclosure you'll need? Our knowledgeable sales team will be able to help! The most common heater control panel applications include manufacturing, industrial food preparation and fabrication, and any industry that requires the mixing/combination of materials or careful temperature monitoring. Choose Bay Power for the hottest heater control panels on the market. All of our custom-built heater control panels are designed and assembled in our UL508a-certified shop before being shipped to you in one piece, installation-ready. We use only the best control panel components from top control panel manufacturers, so you can count on Bay Power to deliver not only exceptional customer service, but exceptional quality as well. Whether you’re looking for a custom control panel or a pre-assembled model, choose Bay Power no matter what your control panel uses may be. Have any old or unused Heater Control Panels lying around? Don’t get rid of them just yet. While we stock a wide range of quality electrical products and solutions, both new and reconditioned, we also buy back your unwanted equipment. So, before deciding what to do with your old Heater Control Panels and components, have one of our expert technicians take a look to see if we can save a few parts, save the environment, and save you some cash. Great service shouldn’t end after the purchase. We pride ourselves on the relationships we build with our customer-first mentality and the quality of our Heater Control Panels and components. That’s why we offer a 1-year replacement warranty on all of our electrical products and solutions from the top manufacturers. Because when you buy with Bay Power, you buy with confidence. We are proud to stock a variety of competitively priced, new and reconditioned components from the leading manufacturers of Heater Control Panels. Thanks to our extensive inventory of Heater Control Panels and components, our resourceful and expertly trained staff will always be able to get the products that you need. Through our extensive network of suppliers, we are able to carry and acquire a huge variety of electrical products and solutions, so chances are if you need it, we can get it. Bay Power’s priority is providing you with reliable, high quality electrical hardware. That’s why our mission is to make sure our reconditioned electrical products and solutions function as perfectly as the day they were built. Because while the quality is high, the cost of Heater Control Panels shouldn’t be. Our selection of new surplus Heater Control Panels may not arrive brand new in a box, but they function just as well, and have never had electricity run through them. All of the quality, none of the packaging, always with our 1-year replacement warranty.